If a reporter for the Athens Banner-Herald hadn’t called, the 2016 Olympics might have come and gone without getting much of my attention. Shame on me, Michael, Simone and other American Olympians. I’ve had other things on my mind. 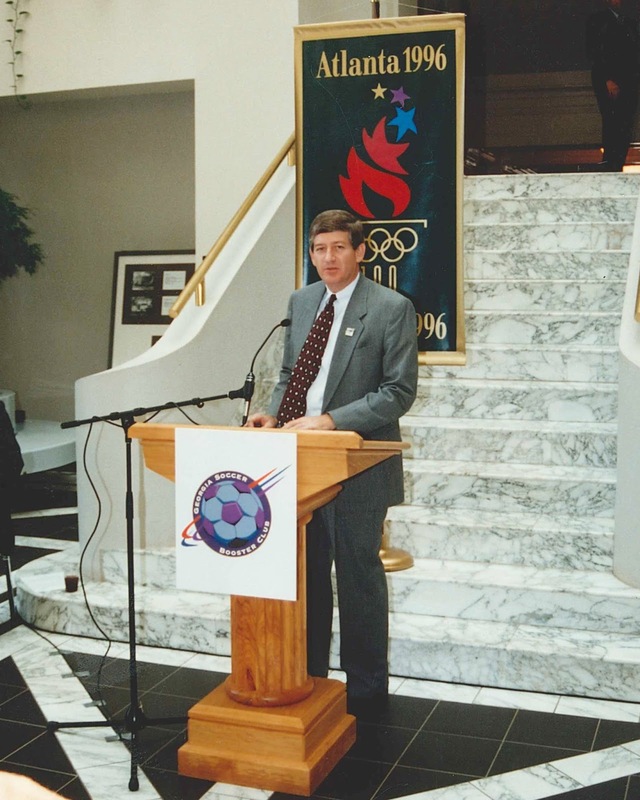 As chairman of Athens 96, I was asked for my memories of the 1996 Centennial Olympics. When the “It’s Atlanta!” announcement was made in Tokyo, Vince Dooley, Billy Payne’s former football coach, said, “Billy, don’t forget Athens.” The man who had the dream didn’t. Athens was the largest venue outside of Atlanta, hosting four events. From the moment Billy shared his vision, I was a believer. And then came a phone call from Athens Chamber of Commerce president Pat Allen. We’d become friends through Leadership Georgia. “How’d you like to chair Athens 96?” he asked. I had the Olympic fever. The only way to cure it was to get involved. From the outset, we wanted Athens and the University of Georgia to win gold medals for preparation and hospitality. –The 28 volunteers of Athens 96 were a dream team. I set our meetings at 7 a.m. In 1993, we started with a smile. In 1996, we ended with a smile. –Every dime had to be raised. The Chamber, the city-county government and the University of Georgia each donated $1,000. From there, we raised more than $500,000 in private dollars. We were frugal, but everything was first-class. We saved half of our money to invest in 33 post-Olympic legacy projects, touching every corner of the community. –Vince Dooley called to say: “We’re taking the hedge out of Sanford Stadium to make room for soccer. Do you want some of the hedge?” Several years later, I reported—with pride—how well my plantings were doing. “I don’t want to hurt your feelings,” he said, “but you can’t kill privet hedge.” He’s right. Ours is still getting its annual trim at the farm. –One day, Billy was on the phone: “Don’t you want to run the torch?” Duh. I had been so busy, I had forgotten to apply. “Be in Toccoa next Thursday,” he said. And I was, skinny legs and all, trotting in Stephens County with a flaming torch. Jogging beside me was our younger son, Eric. Unforgettable. 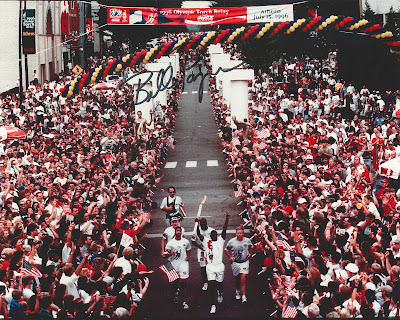 –And there were Billy and his children, Porter and Elizabeth, running their legs of the Torch Relay through Sanford Stadium, where Billy and his dad had starred as Bulldogs. –When 80-something Fred Birchmore was invited to run the torch, he asked, “How far you want me to run it?” When Fred was told one-eighth of a mile, he said, “Hell, I can run that far on my hands.” Indeed he could have. He once walked down the Washington Monument on his hands, and he rode his bicycle around the world. 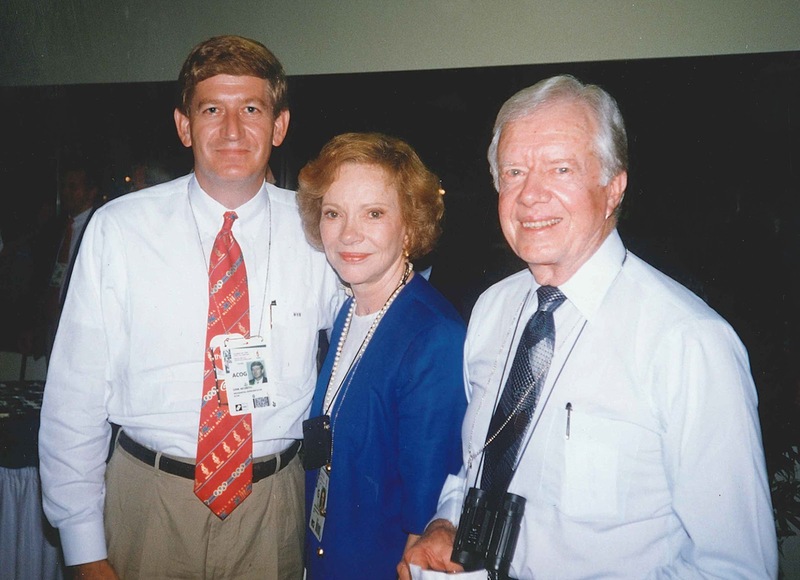 In his prime, he’d jog around Sanford Stadium’s track and then walk up and down the stadium steps—on his hands— to break the monotony. 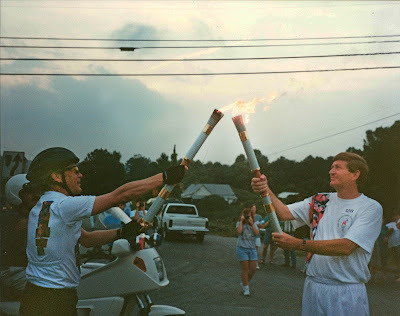 –The only event that came close was sitting in Atlanta during the opening ceremony and wondering: “Who is going to light the flame?” Billy kept that secret sealed tight. The crowd roared when Muhammad Ali appeared with his torch. 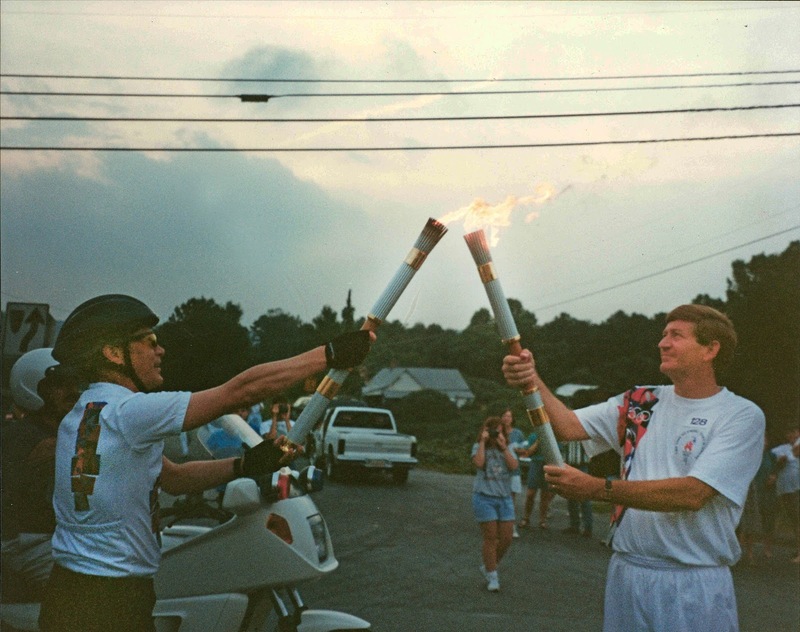 –And let’s not forget when Billy brought the Olympic story to Jesup. He and I were walking out of Sanford Stadium, savoring a Bulldog victory over Alabama. He was just back from Tokyo, too, so the timing was double-perfect for me to pop the question: “Will you be the keynote speaker at our chamber of commerce banquet?” Billy was too happy to say no. Ah, the memories. Gold medals every one of them. 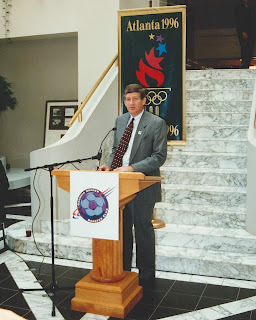 served as chairman of Athens 96 until the completion of the Centennial Games. Payne hadn’t called, I would have missed a chance to run a leg of the torch relay. My duties included dozens of presentations and civic talks. 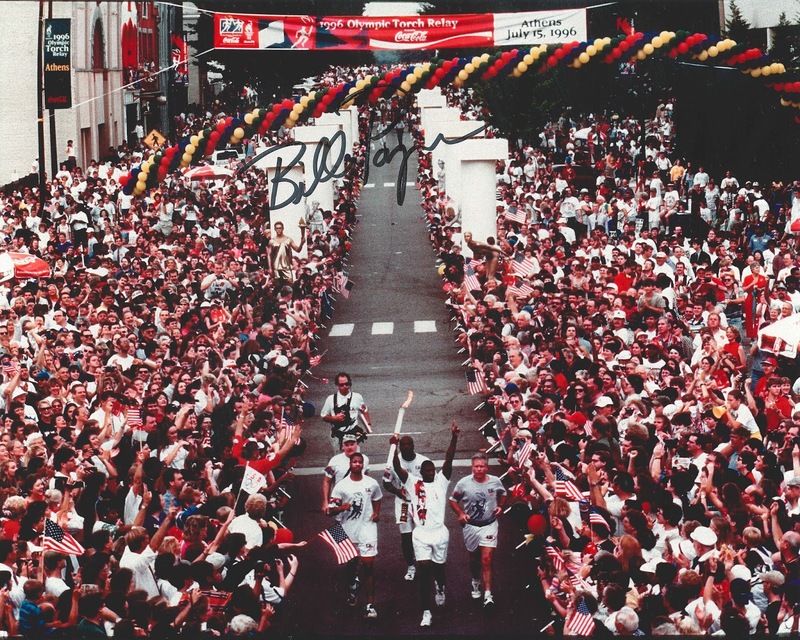 autographed photo of the torch’s entry to Athens. as former U.S. president Jimmy Carter and former first lady Rosalyn Carter.